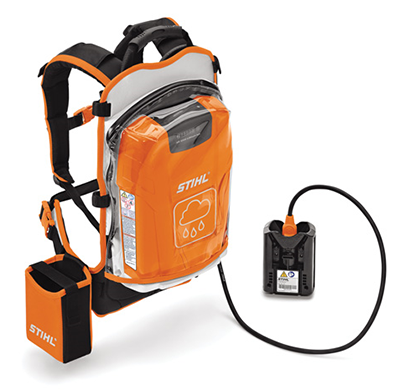 Stihl released the new AR 2000 backpack battery. As the replacement to the Stihl AR 900 backpack battery, the AR 2000 includes an ergonomic hip belt and chest strap that evenly distributes the weight of the battery. Using the backpack battery with its power cable connected directly to the equipment takes the weight of the battery off the unit. The removal of the onboard battery and addition of the high performance cable connecting system shifts handheld weight from the equipment to the back or hip. The AR 2000 comes equipped with built-in sensors and microprocessors that monitor temperature and automatically shut down the battery if it overheats. The battery also comes equipped with numerous features such as audible and visual recharge alerts, rain cover, sturdy housing and durable base plate. Recharging the AR 2000 to 100 percent capacity takes 130 minutes when used with the Stihl AL 500 high-speed charger. As part of the Stihl Lightning Battery System line, users can work up to 11 hours on one charge, Stihl said.